ETA for the next Field Test? Now that 2017.1 has been released, any indication when we can look forward to the next Field Test starting? Update on 27-Apr-2017: the 2017.2 FT for Caché and Ensemble is now available via this page. Update on 02-May-2017: announcement posted here. I am looking for a way to deploy production changes (code and/or production configs) via script or some other systematic way other than the Ensemble/Deploy page in the Management Portal. My goal is to store these configurations in Subversion, then have a piece that can pull the XML from source control and deploy it to a given server. Is there some kind of script that I can run on a given server to perform this deployment? If so, I can tie it up with Subversion using another tool that I have access to. If it helps, we are running Cache 2016.1 (HealthShare 15.01) on Red Hat Enterprise Linux 7. Should calls to a third-party web service go through ESB (Ensemble)? I'm asking this best-practices question on behalf of a customer. They have a Caché-based application, and an Ensemble production deployed in front as an ESB to provide web service API access to the back end application. They're looking for a best practice approach for the scenario where the Caché back end is calling a third-party web service. Should that go through Ensemble too? It's sort of a philosophical design question/debate. The current approach without going through Ensemble would be for Caché to import the service WSDL into proxy classes and invoke those directly from the application code. If the answer to the above question is yes (third-party WS calls SHOULD go through the ESB), what is the best way? One option would be to invoke a restful service in Ensemble from the Caché app. Another would be to expose a web service from Ensemble. That would mean both Ensemble and the back-end application would have to import a WSDL. Hi I'm hoping the community will once more help me out with a question! Right I have a production that takes an attachment from an email and processes it, sending out a hl7 message at the end. This works ok.
a) A backup incase there is a problem with the email or something else further down the line. b) A log of the emails receieved. Prompted by this post about accessing a global at its original location after you have changed a mapping, here's a tip about one specific dropdown in Portal that's sometimes useful. Please let me know in Intersystems Ensemble Prodn, where the configuration setting changes gets stored ? If your application is raising <PROTECT> errors and you're finding it hard to work out why, here's a way to get additional information. Notice that the Enabled column shows a value "No". By default <PROTECT> errors are not logged in the audit. So though my system has seen a total of 2 of the associated events, 0 have been written. Use the "Change Status" link to toggle the Enabled value to "Yes". I am unable to find any classes that will return the status of all the services in a production. Is there one available? I was wondering if the below query could be enhanced to automatically look back 24 hours from the current datetime the query is run. As is now I, of course, have to update the date range in the WHERE clause manually. The query is just getting all MessageBodyClassNames, counting them and then doing an AVG on TimeCreated and TimeProcessed. Nothing too complex. Any input would be greatly appreicated! Getting and Setting mime types. I am attempting to do two things with the mime types. However, myCONTENTTYPE always comes in empty. However, I cannot seem to get the correct syntax. Design a production in a development environment using best practices. Can anyone point me to an example of a DTL & Class method that can pull a base64 encoded PDF out of a MDMT02 message? - how to transform an base64 encoded document into its original binary form for writing to a file. 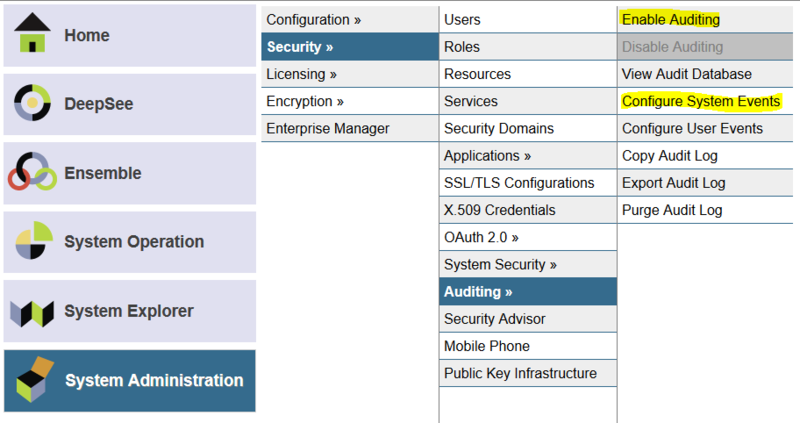 How to set up SSL/TLS for web application? I have built an Ensemble SOAP service (EnsLib.SoapService.Service) as a business service which accepts soap requests from another application. To secure the traffic between the SOAP service and the application i'd like to enable SSL. I see that in the management portal I can upload the certificates, chains and keys and save them as an SSL / TLS configuration. However, it is not clear to me how I apply this SSL / TLS configurtion to the soap service I am running. I would expect something under Security -> Applications -> Web Applications or even on the business service running in production itself, but I can't find it. How do I setup the SSL connection? I have a client sending us data MLLP in base64 format. I'm using the EnsLib.HL7.Adapter.TCPInboundAdapter adapter. What setting do I change to accept the base64? Is there a way to do this? I found the way to store .gz files, but .zip files are different. I only recently noticed the presence of a local database named CACHE alongside the more familiar CACHESYS, CACHELIB, CACHETEMP and CACHEAUDIT. With help from others here I had developed some code to take a Base64 PDF within a OBX.5 and save it locally to the file structure on the server. I had to make a change to the code to return me a String so I can pass the Path back into Ensemble to use it in the message. When I made this change I am getting " ERROR #5034: Invalid status code structure ("/ensemble/data/transfer/AncillaryPDF/TMSAUDIO/Apr-11-1/980512729TMSAUDIO1046784936436537800.pdf")"
Prior to 2017.1, whenever I created a new namespace using Portal on Ensemble or HealthShare it was automatically configured to host productions. This used to irritate me, because sometimes I'm setting up a namespace (for example, to host our Deltanji tool) that doesn't need the extra Ensemble baggage. If you deal with multiple instances of Caché / Ensemble / HealthShare and sometimes have to work at the Terminal command prompt, did you know that you can easily add extra information to that prompt which may help prevent you running a command on the wrong instance? Why does my DTL test tool work perfectly but my DTL only half works when used by the process? I created a DTL to do HL7 mapping. The test function in the tools works the DTL perfectly but when used by the rule in my business process, the OBX segments are stripped and the MRN is gone. The assigning authority and ID type are added into the PID but the actual patient MRN is blank (3.1 value). Different tablepane cell background colors depending on the value of a cell. Has anybody created a way to change the background color of a cell depending on the value contained in the cell. This is simple when only one background color is required. However, if there is a requirement for several different colors depending on the value of the cell, the out of the box <condition/> approach does not suffice. Thank you for any feedback.